Accompanied by my daughter and two grandsons, Carl and I left last Sunday morning for a week in our nation's capitol, Washington DC. Having visited DC a couple times previously, we knew better than to try to stay in the city, so after researching the options, we found a campground in College Park, MD. Cherry Hill Park ( http://cherryhillpark.com/ ) offers a Metro bus stop INSIDE the campground, and it exceeded any expectations we may have had. We had an awesome pull-through site towards the back of the Park. Monday: We weren't in a big hurry so after a good breakfast, we caught the city bus inside the campground and successfully maneuvered the Metro subway system without losing anybody. We went straight to Arlington National Cemetery with intentions of viewing the changing of the guard at the Tomb of the Unknown Soldiers. However, we were turned away when we got there and told to return after 3 PM. There were military personnel everywhere - some with search dogs, plain-clothed Secret Service personnel, a military command post established up the hill ... a very uneasy feeling! We moved away as instructed and watched from near the Columbia /Challenger/Operation Eagle Claw Memorial, but at 3 PM, still hadn't seen anything to warrant such measures, so we walked back towards the facility. Again, we were turned away before we even got close and this time, told to return after 6 PM! After talking to a limo driver, Carl learned that the India Prime Minister was to make a special visit and lay a wreath at the before mentioned memorials (yes - exactly where we had been waiting! ), so we called it a day and started making our way back to the Metro ... all VERY disappointed! Tuesday: Carl had pre-arranged a special tour of the Capitol through the office of NC Congressman Richard Hudson. We had to be there by 9:15 AM, which meant getting up at 5:45 AM to eat breakfast and catch the bus to the subway. Upon arrival at Congressman Hudson's office, in the Cannon Building, we were greeting by his staff member, Jocelyn ... a slim, attractive college student ... and immediately, Austin (the 16 year-old grandson) was extremely interested in politics!! Following a great tour, we inquired about some place to get lunch and one of his staffers recommended District Taco ( http://districttaco.myshopify.com/ ). The "short" walk (about a mile) was rewarded by one of the best burritos I have ever tasted! Wednesday: Back to Arlington and The Tomb of the Unknowns, and this time we were able to view the changing of the guard, THREE times, including a wreath laying by some high school students. Two words: honor and respect. If you have never had the opportunity to view this ceremony, I highly recommend you move that to the top of your bucket list. If this doesn't make you proud to be an American, you need to pack your bags and move elsewhere. From there, we once again took a "short" walk (three-miles this time) for lunch. Our dining advisor, Yelp, had rave reviews for a place called Founding Farmers. http://www.wearefoundingfarmers.com/locations/dc/ Yes - right in the heart of DC, there is a top-notch, farm-to-table restaurant that completely blew us away. I would have never guessed a simple egg-salad sandwich, mint-watermelon salad and pineapple soda could be so delicious and refreshing. One of Carl's childhood friends, Matt Shuster, now lives in VA and they had arranged to get together Wednesday evening, so we headed back to the subway and got back to the campground just as he arrived. Carl and Matt haven't seen each other in 40 years, but you would never have guessed it! Thursday: In addition to all their other amenities, Cherry Hill Park offers tour tickets and transportation to/from the various tour connection sites. We bought tickets for the BigBus jump-on / jump-off tour. The charter bus left the campground at 6:55 AM, headed to Union Station for the connection, so it was another early morning. Our first jump-off was at Lincoln South to see the monuments/memorials. Although it was slightly before my time, the Korean War Memorial has always been one of the most emotional for me. The first time I saw it, it was a misty/rainy day and the soldiers seemed to be crying, and I sobbed. The next stop was the Lincoln Memorial. Then we crossed over to the Vietnam Veterans Memorial Wall ( http://thewall-usa.com/ ). Again, an extremely emotional place for me. In my teenage years, my brother was in the Marine Corps and served in Vietnam. 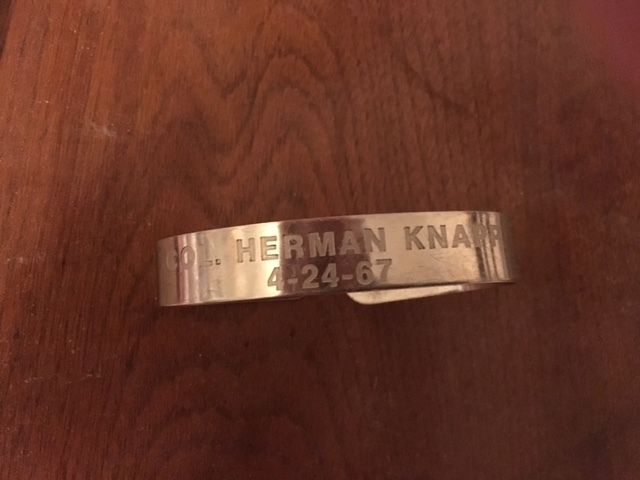 I ordered a POW/MIA bracelet and received Col. Herman Knapp / 4-24-67. Although I knew nothing about this man, I felt a bond with Col Knapp. In later years, I was able to find his name on the "Moving Wall" when it came to a town near me. Now, the internet has made it possible to learn about each of the people listed on The Wall and connect with their families and/or others who also "adopted" the same soldier. According to thewall-usa.com site, On April 24, 1967, Charles Austin was serving as bombardier / navigator on board Major Herman L. Knapp's F-4C phantom fighter bomber. The aircraft was lead in a flight of four dispatched from Udorn Airfield, Thailand on a strike mission over North Vietnam. The strike was on a five span bridge four miles north of the center of Hanoi. The raids purpose was to sever North Vietnam rail links with communist China. An electrical transformer station was seven miles north of Hanoi and was also attacked. During the strike, Knapp and Austins aircraft was struck by a flak burst, disintegrated, and two large pieces of flaming wreckage were seen to strike the ground in a fireball. No parachutes were seen and no beepers were heard. Nevertheless, it was apparently believed that Knapp and Austin may have exited the aircraft, as both men were classified Missing In Action rather than Killed In Action, Body Not Recovered. Eleven years later, based on no information to indicate the two men were alive, they were administratively declared dead. After visiting the other memorials, we were chatting with one of the BigBus reps while we waited for the next bus and once again asked for suggestions for lunch. He promised that Old Ebbbitt Grill ( http://www.ebbitt.com/ ) is the best place around ... great food at great prices. Turns out, Old Ebbitt is the oldest saloon in DC and has quite a history! I had the Bacon Horseradish Glazed Meatloaf, which was served over mashed potatoes and Swiss chard, with cremini mushrooms & Bordelaise. To say it was amazing would not do it justice. You just have to try it to believe meatloaf can be so delicious! Old Ebbitt is also known for their crab cakes, so Carl just HAD to get the crab cake sandwich. It really was delicious ... but even he admitted that mine was better1! A short walk back to the BigBus stop and three stops later, we were back at Union Station, where we boarded the charter bus back to the campground. Friday: Time to pack up and move on, but not quite ready for the fun to end, we stopped at the KOA campground in the Shenandoah Valley, in Natural Bridge, VA.
As a former "foster mother to orphaned squirrels" - I was overjoyed to be greeted by the this cute little furry friend. Turns out, his name is Buddy and after being injured, campers started feeding the little guy and he has learned he can greet the new guests and get handouts! Smart little dude, huh? After a relaxing evening (or as relaxed as you can get with two grandsons in a motorhome) and a good night's sleep, Saturday brought us back to reality. NOW ... TEN MORE WORKING DAYS, and I will be officially RETIRED!! That's when the REAL fun starts. Great Post - Cherry Hill Park is a great campground and wonderful DC on checking out DC... Congrats on Retirement y'all are going to love it. Looking forward to following your travels and hope to meet y'all on the Road!